You may be asked to share ownership of your property (house, car, bank account, etc. with another person who is offering to help you “manage your affairs”. This person(s) may be an adult child or children, a close friend or an acquaintance. It may sometimes seem easier, more convenient, or simply a matter of estate planning to transfer all or part ownership of your property to another person(s), however, it is important to understand any and all legal implications before making such decisions. Let’s say you are the sole owner of property, such as your house, and you are considering adding another person(s) as an owner. If you transfer the ownership as a “joint tenancy,” it means that the property is owned by you and whomever you transfer ownership to in equal proportions. For example, if there are two owners (yourself, and, say, an adult child), each person owns ½ of the property; if there are three owners, each owns ⅓ of the property; and so on. Each joint tenant has an identical interest and holds an equal right to use the whole of the property (including the house). In other words, if you transfer part of your ownership in your house to another person in joint tenancy, whether a family member, friend, or someone else, that person or persons have the same legal rights to that house as you do. This is an important point to understand, particularly if you are contemplating sharing the ownership of your house or other property in joint tenancy with a person from outside your family with whom you may have just recently formed an acquaintance. Also, if you die before the other joint tenant(s), your interest (ownership) in the property will, in most cases, automatically transfer (called the “right of survivorship”) to the other joint tenant(s). In other words, your interest will not “pass” with your estate and, therefore, you will not be able to give the property to other children or other beneficiaries through your will. On the other hand, if you transfer the ownership in your house as a “tenancy-in-common,” each owner holds a separate and distinct interest in the property, not necessarily in equal shares (for example, two owners might have shares of ⅓ and ⅔, or ¼ and ¾). If the portions of the interests owned are not specified on the land title certificate, it is assumed in law that the shares are equal as between the owners (for example, if 2 owners, both would have a ½ interest; if 3 owners, each would have a ⅓ interest). Upon the death of one of the tenants-in-common, their interest “passes” with their estate. That is, you can give your share of the property to someone in your will, or if you die without a will, it will “pass” to the closest relative according to BC laws of intestacy (which means dying without a will) even if the person inheriting the share of property was not formerly one of the tenants-in-common. This differs significantly from a joint tenancy and should be considered when deciding on the type of shared ownership that you desire. What is the nature of the ownership if the nature of ownership is not stated? For real property (eg. house), the ownership is a tenancy-in-common. There are a number of legal complexities that might arise in relation to shared property. These are examples only. It is beyond the scope of this article to explain all the legal complexities and individual circumstances that arise in this area of law. SITUATION 1: You may have thought you entered into a joint tenancy, but you discover that it was never created in the first place, or it has been “severed” without your knowledge. Unity of time – the interest of each must vest (meaning to take effect) at the same time. Therefore, in law, if there is a break in one of the four unities, the joint tenancy is said to be “severed” or broken and the ownership reverts to a tenancy-in-common. For example, if one of the joint tenants mortgages or transfers their interest (even if it is transferred to himself or herself), this action will sever the joint tenancy and, in law, you and the other owner(s) will become tenants-in-common. This is an important point to understand: even if you believe you share ownership in joint tenancy with someone, the other joint tenant(s) can break or sever the joint tenancy without your knowledge or consent. For example, a joint tenant can transfer their interest to someone else or themselves without involving you in the transfer and the effect of it may be to sever the joint tenancy and create a tenancy-in-common between you and the other person or someone else entirely. The result is that on the death of the other owner(s), their portion of the ownership passes with their estate(s), instead of the property ownership coming back to you, as it would under a joint tenancy. SITUATION 2: You may think you have transferred ownership of part of your property to a relative to avoid probate, but they discover after your death that you only transferred the “legal title” and not the “beneficial interest” in the property. legal title means that the holder of the title holds the property for the true owner (the one with the beneficial interest) – for example, you may wish to give someone else legal title to your property so that they can help you manage your affairs, but not the right to use the property for their own benefit. Therefore, just because you think you have transferred a share of your property to another person, it is important to consider the legal effect of the transfer. In other words, did you transfer the type of interest (beneficial or legal or both) that you intended? you can also enter into legal arrangements declaring that the beneficial interest does not transfer to the joint owner (sometimes called a “Declaration of Bare Trust and Agency Agreement, for example, click on Bare Trust and Agency Agreement ”). Note – these two documents are used to show what your intentions are regarding the ‘beneficial interest’ in a property or account. The ‘deed of gift,’ even though it is called a ‘deed,’ does not have anything to do with legally transferring real estate or ownership in a joint account. It simply helps clarify what your intention is. If only the legal, and not the beneficial, interest is transferred, then the surviving owner likely holds the asset in trust for the estate of the deceased person.. This is significant because you may have wanted to enter into a joint tenancy to effect a transfer of the whole title of the property to the other owner after you die, but without the proper supporting documents as evidence of your intentions, this may not, in law, have taken place. Therefore, documentation of your intentions requires careful drafting and assistance from a property or estate lawyer or a notary to ensure that what you want is properly documented. This is critical because, upon your death, this documentation may become the primary source of information used to determine how you intended the property to be transferred. SITUATION 3: You want to gift some of your property to your adult child prior to your death, or outside of anything that is in your will, but you have heard about a presumption in law that would undo the effect of the gift if you don’t record your wishes properly. If you wish to “gift” a portion of your property to your adult child(ren) outside of your will so it does not make up part of your estate, there is an important presumption that exists in law that you should be aware of. Normally, without evidence of a true gift, the law will presume that a transfer without payment to another person was intended to be done merely to assist in the management of the person’s affairs (sometimes called a resulting constructive trust). In effect, the law says that the person holds the property “in trust” for the property owner and that, upon the death of the property owner, the property passes according to the deceased property owner’s estate. This approach was confirmed by the Supreme Court of Canada in the case of Pecore v. Pecore where the court made a decision that this presumption applies in the case of property transfers as between parents and their adult children. The presumption is “rebuttable” in that it will be up to the adult child to provide evidence or show that their parent intended the property to transfer to the adult child, beneficial interest and all. If they fail to do this, it will be presumed that the adult child became an owner solely to assist with the management of their parent’s financial affairs. As such, the property will pass according to the parent’s estate (according to their will or, if there is no will, according to the laws of “intestacy”). It is important to be aware of this presumption if you want to gift your property before your death to your adult children. Your intentions should be clearly documented, as discussed above. It is also important to be aware of this presumption if you discover, after the death of a loved one, that their property was “gifted” to adult children. 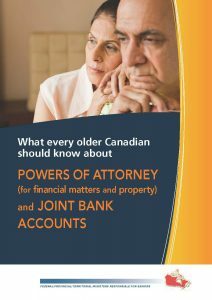 The adult children will need to point to some evidence of the deceased parent’s intention to gift the beneficial interest to them in order to uphold the transfer. if you are transferring to an adult child, make sure your intentions are properly recorded at the time of transfer. The above BC Centre for Elder Advocacy and Support public legal education article was written in 2009. It contains general information only and is not a substitute for getting legal advice about your particular situation.